Welcome to CoastalVillas - dreamholidays! Since 1998 we offer quality vacation rental and sales of villas and apartments on the Costa Brava and Costa Barcelona. Our aim is to make sure our guests have an unforgettable dream holiday! We are a small business focused on offering personalized service for both our guests and owners. 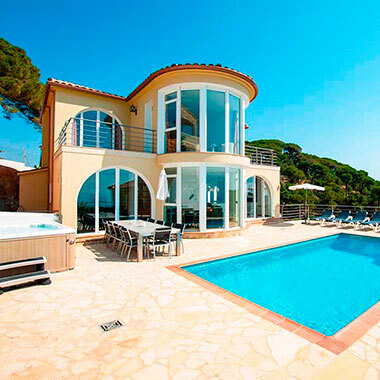 We are specialized in the holiday rental and sale of quality villas on the Costa Brava and Costa Barcelona, in Spain. We personally manage all our properties to assure quality standards. We contract our properties directly from the owner without intermediaries. We really want to make you feel at home! We are specialized in the rental and sales of up-market real estate on the Spanish Coast. Our holiday villas are located on the Costa Brava between Blanes and Tossa de Mar, and on the Costa Barcelona Maresme. Our charming villas and apartments are located on exclusive spots, with breathtaking views of the Mediterranean, private pool or at walking distance to the beach. Starting to like our properties? Coastalvillas is a small family run business. Since 1998 we personally manage all our properties on spot. Interested in buying, building or selling your villa? We can assist in all of these. We have local contacts, knowledge and can advise on notarial, finance, location and design. Good morning, I just want to thank you for providing an excellent villa for our holiday. The service you have provided has been second to none. On behalf of all our family I'd like to thank you and your parents for the luxury holidays. We enjoyed staying in the villa. Everything was perfectly arranged. Your family is a very professional team and if next time we decide to come to Spain we'll use your service once again. Hi, Just wanted to say thank you for your great service regarding our recent stay. You've been a real pleasure to deal with, very efficient and the apartment was great. I will certainly reccomend your company to friends etc. Thanks again we had a great holiday. Check out our last minute offers! Book your villa and start enjoying!